We must all stand by Mimi. She is the most credible journalist on the ground in Cameroun. Her arrest and detention is part of the ongoing acts of intimidation and cover-up by the terrorist genocidal regime of Paul Biya in Yaounde. Mimi told the truth about the bullet that killed the American missionary Charles Wesco and for telling that truth and exposing the targeted killing of Mr Wesco she must be intimidated, punished and used as a warning to other journalists never to dare any form of factual reporting on the crimes of the Cameroon terrorist military in Southern Cameroons Ambazonia. 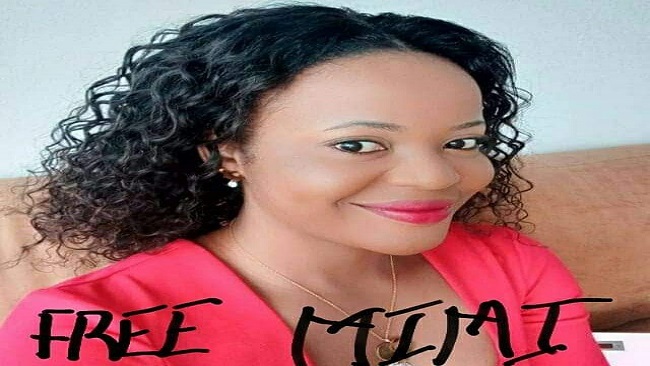 Yes Mimi through her skills in investigative Journalism saw the bullet that killed Mr Wesco, being that of the Cameroun government military gun, and she said so. Telling the truth in Cameroon journalism is a crime against the government. The Paul Biya regime defends and promotes and rewards only those journalists who propagate their lies and take part in the cover up of their crimes and evil deeds. Mimi told the truth and she is being targeted. Just like the killing of Mr. Wesco was targeted. Could it be that when the Cameroun assassins saw Mr. Wesco, the murdered American missionary, they thought he was the Ambassador to Yaounde whom they had threatened with death? Remember they had said they will kill the American Ambassador when he said the government was carrying out targeted killings and advised the genocidal terrorist Paul Biya to consider his legacy citing examples of great men and leaders. If you put the pictures of the American missionary, Mr Charles Wesco and that of the American Ambassador to Yaounde, Cameroun, you will see the resemblance and the assassins could have easily confused Mr Wesco for the Ambassador. Let your Congressman, Congresswoman and Senators see this. Let the American representatives and governmental officials know this. Let Mr Wesco’s family and church community know this. Let them know that the intimidation and detention of the journalist Mimi is the continuous efforts of the Cameroun government to hide and cover-up the truth on the killing of the American missionary, Charles Wesco. Let us stand by Mimi, an innocent and effective journalist who was only doing her job. Our Twitter warriors please go to work. Our cyber warriors please go to work. All of those in our midst with political connections please say something; please do something for Mimi and the truth of the killing of the American missionary Charles Wesco.